The Kayalu Clawpole® is a clamping mount for GoPro Hero cameras (all models) that provides a secure extension from a round rail, square rail or shelf-like surface. 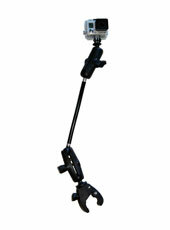 The ClawPole stands 20 inches (51 cm) from tip of clamp to GoPro Hero camera base. The ClawPole provides multiple degrees of freedom for unparalleled articulation, with four ball joints seated within two adjustable spring-loaded arms. The ClawPole is constructed of marine-grade materials, intended for outdoor use in freshwater and saltwater environments and capable of withstanding exposure to heat and sunlight (UV). The mount is constructed of stainless steel, aluminum and composite polymer -- not plated steel and ABS plastic used in the manufacture of nearly all alternative mounts. The ClawPole's components are Made in the USA by RAM Mounting Systems and Kayalu Gear. Included components include a RAM Toughclaw, RAM spring-loaded coupler-arms, RAM “B” balls, RAM adaptor for all GoPro camera models, and a stainless steel Kayalu Toughbar™. S. H. Pierce & Co. / Kayalu is an authorized OEM of RAM Mounts.